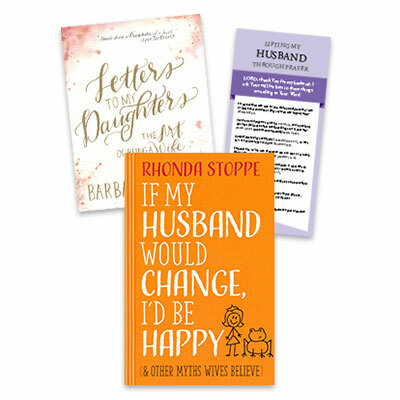 Purchase If My Husband Would Change, I'd Be Happy and Letters to My Daughters at the special price and receive FREE the Lifting My Husband through Prayer card. Through more than four decades of marriage, Barbara and Dennis have seen it all—triumphs, tragedies, mistakes, and enduring love and joy. As Barbara's daughters began their own married lives, she wanted to share with them lessons she'd learned through her own marriage as well as those gleaned from years of ministry to couples. In these thoughtful letters she answers tough questions compiled from a multitude of young wives, addressing the realities of marriage with honesty and warmth. Marriage is a complex work of art, and the callings of husband and wife are important individually but must work in harmony to create a beautiful whole greater than the sum of its parts. Throughout this lovely, gift-worthy book, Barbara uses the arts—painting, dancing, gardening, etc.—to reveal this truth in a wise, insightful, and visually captivating way. May Letters to My Daughters inspire you to embrace the masterpiece of marriage God wants for you.